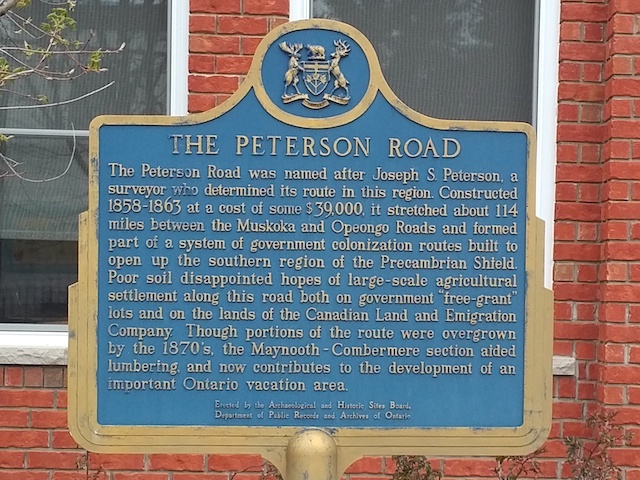 The Peterson Road was named after Joseph S. Peterson, the surveyor who determined its route in this region. 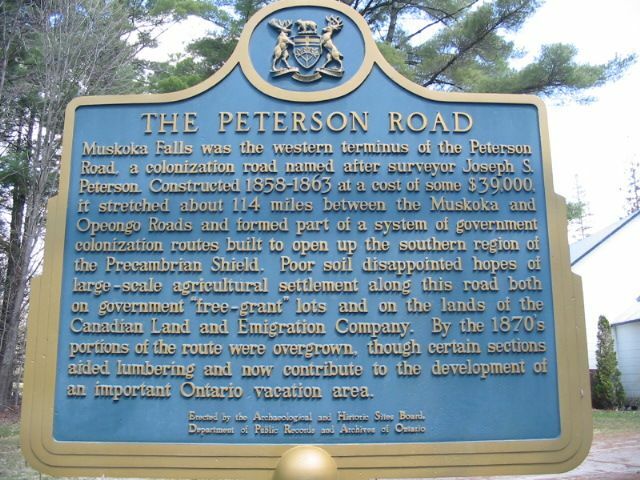 Constructed 1858-1863 at a cost of some $39,000 it stretched about 183 km between the Muskoka and Opeongo Roads and formed part of a system of government colonization routes built to open up the southern region of the Precambrian Shield. Poor soil disappointed hopes of a large-scale agricultural settlement along this road both on government "free-grant" lots and on the lands of the Canadian Land and Emigration Company. Though portions of the route were overgrown by the 1870's, the Maynooth-Combermere section aided lumbering and now contributes to the development of an important Ontario vacation area. 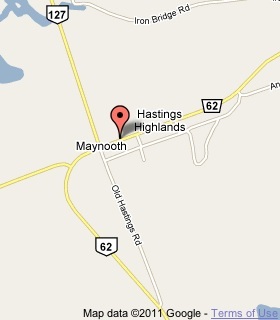 The Peterson Road also continues past Maynooth and well into the Algonquin Park region. As it is true the the road was intended to open up the area for agriculture, it also lent a great aid for the lumber companies to get well into the interior and thus profit by the efforts of the generation before. Maynooth would not exist today if it weren't for the lumber industry at the time. As it's also true that the Peterson Road in used for vacationers, it's also a well known route for motor cyclists and people that own cottages along it's path. I was there Monday looking for the plaque. It's been displaced to accommodate some new centre the town has built. There's very nice landscaping outside the new building, and I hope they eventually get around to replanting the plaque. The highway sign is still there to tease you that there should be a historical marker. Very disappointing, because I don't get out that way very often.... it's rather far from anything.